1. Motorcycle Jacket with Fringe - Sooooo, I've be looking for a motorcycle jacket for a few years and when I saw this one at Banana Republic deeply discounted on the sale rack with an additional 60% off I had to cop. It was my size and looks really great on and has become one of my favorite fall finds. 2. Black Licorice from Lakrits Roten (licorice root in Swedish) - while visiting Stockholm we made a stop at Lakrits Roten, a cute little boutique dedicated to all things black licorice, to pick up some goodies. I love black licorice and was thrilled to grab this little bag of some to bring back home. Every little bite reminds me of my time there. 3. New Balance 420 Capsule Composite Running Sneaker - I packed some cute shoes for my trip to Stockholm but ended up wearing these everyday. They went great with jeans, of course, but were a lot of fun with dresses, my favorite leather skirt, and faux leather pants. I highly recommend these. 4. The Fox and the Star - While visiting a bookstore in Durham last week my eyes caught the cover of this lovely book by Coralie Bickford-Smith. Each illustration on every page is beautiful. The pops of orange among the minimal navy and gray palette made me smile all the way through. 5. Glitter Stud Earrings - I love subtle mysterious sparkle, so when I saw these online the other day I quickly added them to my wishlist. Totally in love with these prints by artist, Erin Robinson, from her shop Brooklyn Dolly. Two weeks ago today I returned from a wonderful trip to Sweden. It was my first time in Scandinavia and it was pretty amazing to spend a lazy week in the charming city of Stockholm. From afternoons doing fika (loose translation: a break that consists of coffee and pastries) to boutique and gallery hopping and strolls down cozy cobblestone streets my time there was the refresher I needed before gearing up for the launch of I Love My Hair. The visit was quick but I do intend on going back to visit soon. Which brings me to my question, any Fly visitors who live in Stockholm? I want to know more about your city, mainly about the art and design scene. Favorite shops, artists, events? Please comment below. Today is the birthday I Love My Hair. This means for those who pre-ordered your package has shipped, and the book is now available on bookshelves at most local bookstores. And just six months ago this was all just a dream. 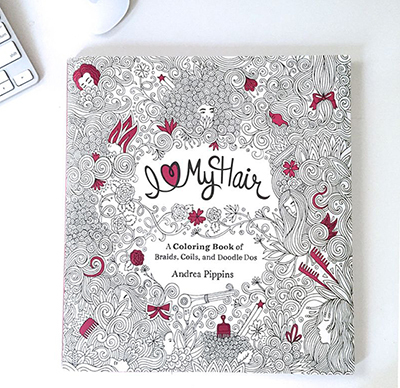 I Love My Hair is a coloring book about hair. A topic my work has covered for the last six years. This has been a dream project because of the topic and because I love to draw, or more specifically doodle. So I Love My Hair is filled with intricate doodles and funky lettering waiting to be embellished by you. 1. To create art. I am an artist. Drawing is my world. And I wanted to produce work that challenged me and also reflected my interests and background. 2. Produce art that represents my passion to empower all women and girls to love themselves. 3. And encourage others to follow their dreams. The opportunity to work on this project came a few months after I resigned from my full-time faculty position. Without much of a plan and with little savings, I decided to seriously pursue my dream to work full-time as an artist and illustrator. I strongly believe I Love My Hair happened because I took that leap of faith. 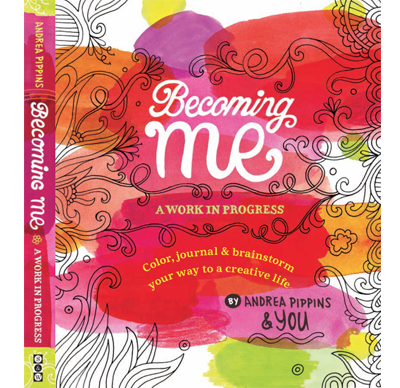 So this book is not only about fun coloring and self-love but also about living my dream. For the last few weeks leading up to the launch of I Love My Hair I've been posting on Instagram little facts I've learned about hair while working on the book. Fun things like the origin of the Jheri Curl and the bobby pin, and the inspiration behind Carmen Miranda's headdress. But here on Fly I'd like to share the most important things I learned during this process. And these are the things I learned about myself. I learned how important it is for me to draw everyday. I need it. My life feels deficient without it. It's my meditation. It's how I stay grounded and connected. I learned what it means to be an artist. An artist who is a woman. An artist who is a woman of color. During this process I learned that others may want to define what that means for me but that I must always stand my ground and remember that I am the only person who gets to determine what that means in my life. I learned to be more definitive and decisive. Short timelines will do that. I learned what it really means for me to be a businesswoman. And I was reminded to always be myself. Always staying true to who I am at my core. I Love My Hair has been a dream. The team at Schwartz & Wade have been so supportive and amazing through this entire process. Friends and family, and my social media family have been super encouraging and enthusiastic about I Love My Hair. I am forever grateful for all who have supported me in living my dream. I hope you will be able to come out and celebrate. See the posts below for upcoming events. I will be posting more soon. Also, have you learned any lessons lately? While working on a project? Please share! I hope you'll come out to help me celebrate!